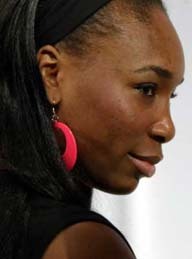 Venus Williams is a professional tennis player, famous for her dominating game, and easily recognized by her height (6'1") splashy outfits, and cornrowed hair. She was named 2000 Sportswoman of the Year by Sports Illustrated. Her sister Serena Williams is also a top-ranked player. Venus started playing tennis at age 4, and was coached mostly by her father, who taught himself tennis from how-to-play books. The family was poor, and Venus's childhood was spent in the high-crime areas of Compton, California. Her father used to take all five of his daughters to the run-down public tennis courts, but Venus and Serena showed the most aptitude. Venus says she also learned much from watching matches on TV -- copying the footwork, and noticing that the best players found their opponents' weakness, and then kept hitting the ball into their weak zones over and over. Eventually both girls came to dominate the junior circuit, before Venus turned pro at 14. As a professional, she has won several big tournaments. She has a multiyear, multimillion contract with Reebok, making her "without question, the biggest woman endorser ever". Venus also has a deal with Wilson Leather, to create and market her own line of athletic products. Venus runs an interior design company in her spare time, and said years ago that she didn't intend to play tennis competitively past age 26.